On Thursday, January 22, 2009 my dear friend Mary Ericka Brooke Schneitman passed away after a long struggle with Marfan Syndrome. Brooke and I met in August 2005 when I first came to seminary and we quickly became friends. Brooke suffered an aortic dissection just 33 days after I met her - but it was very apparent during that first episode that she was insanely loved and cared for by the entire seminary community. 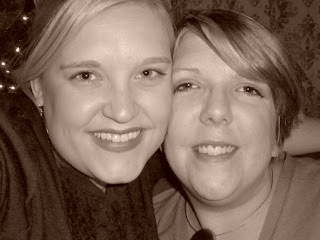 We kept in touch during her recovery and I was insanely excited when she returned to Lexington the summer of 2006 to complete her seminary degree. Although Brooke continued to struggle with the "side effects" of Marfan Syndrome, Brooke continued to live a very full life. Brooke has been a daughter, a sister, and a friend. Brooke has known intense friendships, romantic relationships, a great family and has offered intense amounts of love to everyone she meet. Brooke not only graduated college with a ministry degree, but successfully graduated with a Master of Divinity degree and was ordained as a minister in the Christian Church (Disciples of Christ). Although I didn't know Brooke for very long if you're measuring in years - Brooke was most certainly one of my best friends. I could trust Brooke that I could always be myself, that she would be supportive and loving, but she also always managed to keep me honest with myself and grounded amid the chaos I call my life. She was an amazing friend, sister, counselor, angel and minister. She was also an amazing artist that was able to grasp the many emotions of life and make them tangible for many to see. She touched the lives of everyone she knew and will be missed by so many. Brooke was an inspiration to me in many many ways. I find intense inspiration in the ways she approached her ministry and in the approach she took on life. I am most certainly a better person for having known her. I am inspired by her relationships and her friendships, and by her dedication and loyalty. She was passionate and focused, yet fun-loving and carefree all at the same time. Brooke's strength and resolve were unparalleled, and I only hope to keep alive the wonderful things that she taught so many. Brooke most certainly took the road less traveled, and while I'm sure it made all the difference for her - she also made an intense difference in the lives of those she met. Brooke - I am so proud of you for being such an amazing woman - I have loved knowing you and I am so thankful that I got to be a part of your life, even for just a little while. I will miss you desperately - and I'm still struggling quite a bit with the idea that you won't be here. Your strength and passion for life will be remembered and honored. I know that you are at peace, and that you are no longer in pain - for which I am grateful. I love you Brooke - know that you were, are and will always be loved by many.